The lights are strung, mistletoe is hung and the background music consists of familar Christmas tunes. Hopefully your shopping is complete thanks to a little help from our Area3 2017 Christmas Gift Guide. With a bit of luck all those presents are wrapped and safely under the tree! Without a doubt the season festivities have already begun! From staff Christmas parties to gatherings with family and friends, the nightly events are endless. For those of us who have completely forgotten about the amount dinners we will need to attend (and possibly host), or simply don’t want pictures wearing the same outfit twice – read on! Time to give your go-to little black dress a rest and amp up your holiday style! If there’s one time of year where a little glitz and glam is acceptable, it is definitely the holidays. Before you go out and find a number that covers you from head to toe, remember that a little goes a long way! Some people might argue that jumpsuits are a bit too casual, but we think that they are a perfect alternative to a dress. They are so easy to wear and a favorite here. We like the simple cut and nice texture of this belted velvet jumpsuit from COS which can be dressed up or down. Dynamite also has an affordably priced belted jumpsuit in burgundy with slit sleeves that would pair nicely a statement bag. For a dress that has some shine, but isn’t glittery, this printed silk slip dress from Little Moon, available at Aritza is a great way to go. No outfit is complete without a great pair of heels! Whether you want a classic pump or something a little more daring, the options are endless. We love the simplicity and gold detail of this Acedda pump from Aldo . If you have decided to go with a simple dress or jumpsuit, turn heads with this lace-up chunky heel from RAYE . Finally, top off your outfit with a bag or clutch that holds all your evening essentials! Your phone and lipstick need to go somewhere, right? 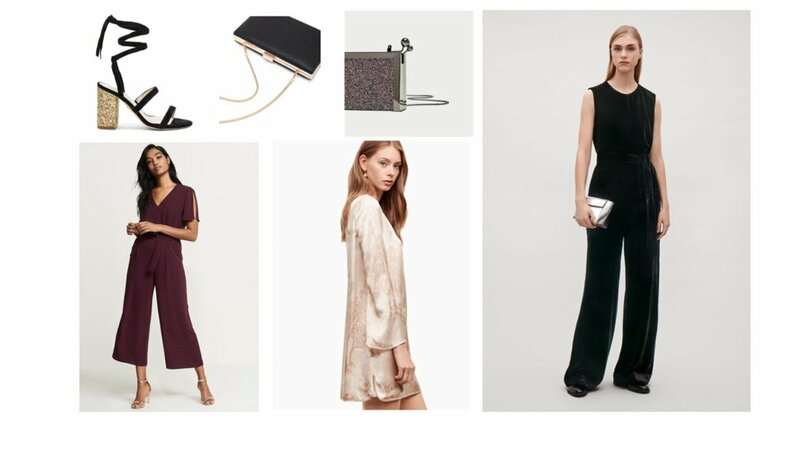 The box clutch is hot this season and a few stores like Zara and Nine West have some great options. Ever New also has a chic box clutch in a timeless black faux leather with gold hardware. Do you have many holiday parties to attend? Transform any outfit with a quick switch of footwear, jewelry and a bag. You’re good to go!